First, we are starting to transition Google Product Search in the U.S. to a purely commercial model built on Product Listing Ads. This new product discovery experience will be called Google Shopping and the transition will be complete this fall. We believe that having a commercial relationship with merchants will encourage them to keep their product information fresh and up to date. Higher quality data—whether it’s accurate prices, the latest offers or product availability—should mean better shopping results for users, which in turn should create higher quality traffic for merchants. Existing Google Product Search merchants can receive $100 AdWords credit toward Product Listing Ads if they fill out a form before August 15, 2012. In addition, merchants who want to stand out from the crowd can choose to participate in our new Google Trusted Stores program. Google Trusted Stores is a badge for e-commerce sites which gives users background on merchants—whatever their size—including ratings for on-time shipping and customer service. Google stands behind merchants that have earned the Google Trusted Stores badge with a $1,000 lifetime purchase protection guarantee per shopper. 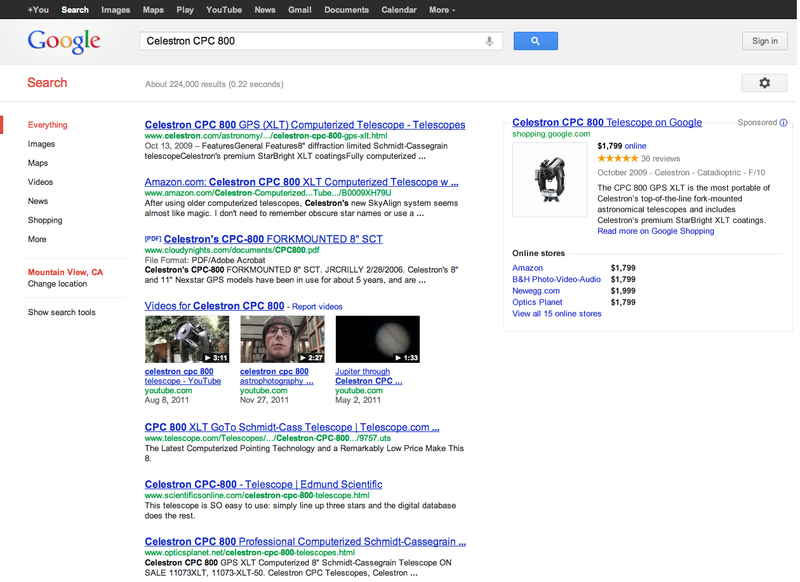 Second, starting today we’ve also begun to experiment with some new commercial formats on Google.com that will make it easier for users to find and compare different products. These include larger product images that give shoppers a better sense of what is available and also the ability to refine a search by brand or product type. 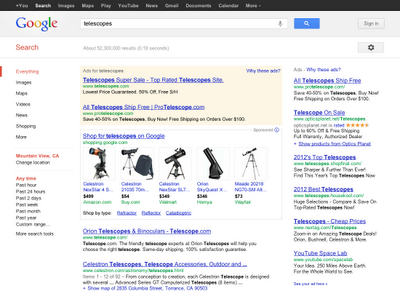 For example, here’s what stargazers could see on Google.com when searching for [telescopes]. 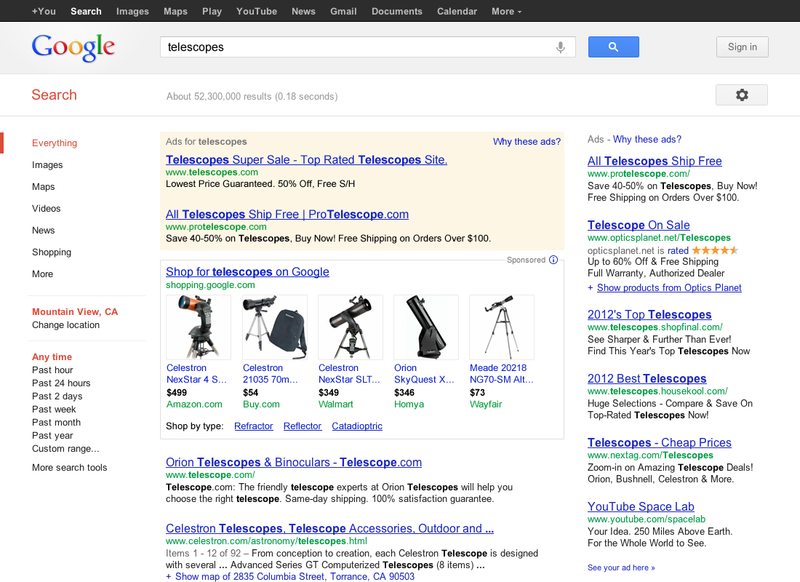 These new formats are clearly labeled “sponsored,” and take space currently occupied by AdWords. If people are looking for a specific product, such as [Celestron CPC 800], they might also see a new design that summarizes information about that particular item neatly in one place. They can then easily decide whether it is what they want, and buy it from their merchant of choice. We’re excited about building delightful shopping experiences for consumers in close partnership with merchants. Google Shopping will empower businesses of all sizes to compete effectively--and it will help shoppers turn their intentions into actions lightning fast. Today’s changes are a first step toward providing technology, tools and traffic to help power the retail ecosystem. Truly great search is all about turning intentions into actions, lightning fast. In the early days of Google, users would type in a query, we’d return ten blue links, and they’d move on happy. Today people want more. When searching for great local restaurants, people want places to eat right there on the results page, not another click or two away. It’s the same with hotels, flight options, directions and shopping. Organizing these types of data can be very different from indexing the Web, because the information is often not publicly available. It requires deep partnerships with different industries—from financial services and travel to merchants who sell physical goods. Today we’re announcing a new initiative to improve our shopping experience over time--so that shoppers (your customers) can easily research purchases, compare different products, their features and prices, and then connect directly with merchants to make their purchase. Seems like a bogus move to me. Switching everything to ads. Lost a large chunk of my 'Google feel good' feeling with this. The most recent moves by the company show a transition away of letting the little guy play to being a 'big brand' play ground only. Charging small business for Product Search will price them right out of it the same way that $1-$5 per click for AdWords ads priced small business right out of that system. In my opinion, this is a DISASTER for small business competing against the big boys if I'm reading this correctly! "Today we’re announcing a new initiative to improve our shopping experience over time--so that shoppers (your customers) can easily research purchases, compare different products, their features and prices, and then connect directly with merchants to make their purchase." This is about Google MAKING MONEY! It has nothing to do whatsoever with improving the "shopping experience." If i am reading this correctly, it sounds like google is changing Shopping to a per click service. This is one of the worst ideas i have ever heard! Google shopping has been one of the biggest pain in the butts to work with over the last 3 years that we have been using it. We have spent thousands of dollars in man hours to get it to function. If it was a cost based service back then we would of just thrown in the towel. Please don't ruin Google Shopping! What about other Countries in Europe? Are there any plans? This change is only for the United States currently. Thanks for your question. This appears to be another shot at small businesses from Google. How can small businesses hope to compete with larger companies like Amazon, Target, Wayfair, etc. in putting money up for ads. Google shopping ha not been a level playing field in a while, but this just makes things infinitely worse. Our company installs about 1,000 workstations each year, in every case with Google set as the search provider. We have preferred Google because of its honest approach to search, as well as the fact the search page is clean and loads quickly. Effective today, our policy has changed. I know it isn't much, but we are not supporting the rigging of search in this manner. I am confident others will see the benefits in seeking out other search alternatives that don't reflect a compelling need to prioritize the highest paying companies leaving smaller companies (like ours) to twist in the breeze. Thanks for the help, this could really help me in doing my work more effectively. You can also take help from the free online ads sites so as to make it really good and profit making business. This will make you reach the target profit makers on time and with correct message.